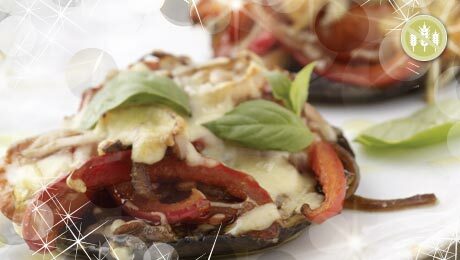 Portobello Mushrooms are a great base to this vegetarian dish, you could add some bacon pieces or chicken as a non vegetarian dish. Remove the stalks from the mushrooms and lay gill side up on a baking tray. Drizzle with a little oil and place under a preheated grill for 4 minutes on each side. Heat a pan and add some oil, add the cherry tomatoes, red onion, red pepper and balsamic vinegar and cook for 3-4 minutes until softened. Add a spoonful of mixture onto each mushroom. Top with some grated cheese and return to the grill for 3-4 minutes until browned and bubbling.